Jan 7, 2019 The Mishaps of Dan return Returns! Jul 31, 2018 Upcoming Conventon Appearances! Sep 25, 2017 The Mishaps of Dan is returning! Jun 22, 2016 OPEN for PAYPAL COMMISSIONS! Jun 9, 2016 Back from Wizard World! May 15, 2016 Gearing up for Con Season! timberking has started a donation pool! Because kindness goes a long way. The Mishaps of Dan return Returns! Lol I wanted to write a new journal for a while now that the 2018 con season is done and I just came back from a pretty fun MagFest2019! FIRST OF ALL, HAPPY NEW YEAR! It's always great celebrating the holidays and stuff with friends and family in my neck of the woods. And second, I want to point out that this year I will probably be doing my con appearance list by month or so as they come up. I'm not 100% sure of where I'll be featured just yet and I still need to iron out those kinks as the year goes on! The next place you can catch me is the Comics Bar Con at Farmingdale, Long Island, NY in February! It's a pretty casual convention that's one day and very chill! Onto business: I will be posting new artworka and hopefully commissions from all of my conventions from last year and this year along with the complete collection of my Inktober art. I have a lot of content that I've posted over on my Twitter page and my other social media that I need to also post here! In terms of the Mishaps of Dan, the keen viewers might notice that there has a been a huge bump up of content since September because the comic is back in full force with WEEKLY updates! The comic itself will indeed receive weekly updates and when there isn't a comic there will be special DOUBLE feature the next week! In addition, there will be new artwork in general that'll also be featured on this page too! Thanks again for all of the patience with my goofball hide! Comic 153: "The Invitation"- The invitations are out for the wedding! Dan's inviting everyone! Even the town bully! 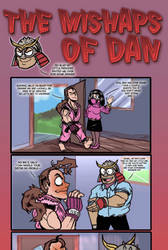 All of Dan's old buddies from the original Saikyo squad have been invited! Who will come to the big bash???? Happy #easter with a couple of original characters, Eydis the rabbit archer and Phoebe the bird knight who fit the bill! Comic 152: "A Jade for your Thoughts"- Over on the bride's side, Mileena, Kitana and Jade are planning the wedding dress for Mileena to wear! Jade has not been around for a long time and she's glad to be back in the fold. Finished the other half of the Link's Awakening impromptu series. On to the print shop with these! For anyone who's played the game, there's a spoiler in the drawing itself. Anyway, I've decided to update my profile since its two years old. So I'm just going to go ahead and re-introduce myself as timberking, the author of the Mishaps of Dan series, Zephyr and a series of smaller illustration projects such as Cyndy 2.001 and Mark and Elaine. My work varies in style and can go from east to west quickly. I do do commissions when I have the opportunity and just contact me if you're interested. See you guys later! Thank you so much for the fav <3! Hope you have an awesome week :3.